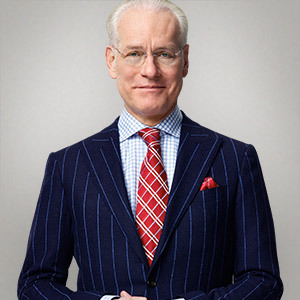 Tim Gunn says, “Be insatiably curious about everything” — and he clearly heeds his own words. His Twitter account reflects multiple personalities: educator, author, fashion therapist, and Project Runway mentor. He’s also covered the Academy Awards red carpet and appeared on various TV series and films. Gunn made his comments at an appearance at New York’s 92Y on Tuesday, where he was interviewed by fashion insider Fern Mallis. A self-described “truth teller,” Gunn is known for helping others with makeovers. He’s also continually reinvented his own career, and he recounted some of the high and low points at the event. Yet by the end of season one, he felt validated when the show caught on and was nominated for an Emmy. Nine more nominations have followed during 13 seasons, and Project Runway remains a hit now for Lifetime TV. Gunn once told a story to the New York Post about Vogue editor Anna Wintour being carried down five flights of stairs by two male bodyguards from a fashion show in New York since she doesn’t like to ride in elevators with others. Wintour’s people demanded a retraction, which he refused. After further discussions, he sent her a letter and a bouquet of white flowers. He also lamented that air travel now is “like one big slumber party,” with passengers wearing pajama-like outfits. Gunn has written four books, starting with a 2007 guide to quality, taste and style. His next book in 2010 outlined his “golden rules,” such as accepting responsibility for one’s actions and taking the high road. His new book, The Natty Professor: a Master Class in Mentoring, Motivating and Making it Work!, reflects his many years spent teaching at Parsons School of Design, where he re-positioned the fashion program. The chapters spell the word ‘TEACH’: truth telling, empathy, asking, cheerleading, and hoping for the best.